The mother-daughter team of Judy Zehner and Kim Mosher specialize in original designs of the natural world of the American West, including Native American designs. They call attention to humankind's connection to the earth and its inhabitants - four-footed, furred, feathered and finned. Their designs embody beauty, strength, symbolism and spirituality. Their "counted patchwork" process, easy piecing techniques and relaxed teaching style have won many friends. 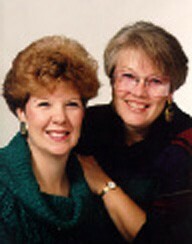 They were instructors at the 2004 Quilt Retreat. The two have had the good fortune to spend their lives in rural Colorado with farm animals to nurture and wild creatures to admire.